Body Language & Emotional Intelligence: Negotiation Secret # 339: Don't Point at Me! I am not your child! Don't Point at Me! I am not your child! 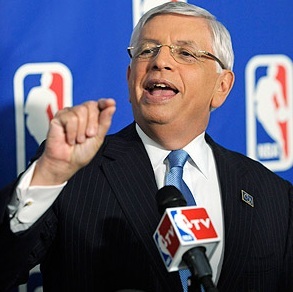 Yesterday at the NBA labor dispute negotiations, Dwyane Wade of the Miami Heat is reported by many to have got very angry, stood up and shouted at Commissioner David Stern, "Don't point your finger at me, I'm not a (your) child!" No known video or photos exist of this incident at the time of this post (the above photo, discussed below, was taken at a different press conference), but if Stern did in fact point at Wade, or anyone else, it is not at all surprising that he had this or a similar reaction. In most all cultures it is consider a very insulting to point. If you feel you must call attention to something and you feel the need to point - point with your whole hand, arm out stretched with your palm up and open with your fingers relaxed. This gesture is not thought of as pointing in the conventional sense. It will bring extra awareness to someone/something and not incite negative emotions - indeed it will often help to foster understanding and openness. Of course, your facial expressions/other body language as well as your words and tone should also be congruent. In the above photo, Commissioner Stern is probably attempting to emulate a "Politicians Point", which has been popularized by candidates and office holders because it too, if used properly, has a very low inflammatory potential. Stern is not pulling it off though (see George Mitchell demonstrate it here - A Friendlier Way to Point). While pointing with two fingers (or a finger and thumb), is not as bad a pointing with a single finger, it still is incendiary and a gesture which should not be used.